Alistair Darling: "What you're now seeing is a cultural change"
Chancellor Alistair Darling has announced that the government is limiting bonuses paid out to staff by the Royal Bank of Scotland (RBS). "We want to see a cultural change where short-term bonuses are replaced with incentives for the long term," he said. Mr Darling said bonuses at RBS would be cut from the £2.5bn paid last year to £340m. There would be "no reward for people who have failed," he added. And future bonuses will no longer be paid in cash, but in shares. The bank would pay "the minimum it can with regard to its legal obligations," the chancellor said, referring to the fact that some employees are contractually obliged to receive bonuses. Addressing concerns that directors are those that have benefitted most from the bonus culture in the past, the chancellor said front line staff would be getting some reward. "Of course they've looked after the low paid," he explained. Of the £340m in bonuses paid out, £175m will meet contractual obligations for some investment bankers. Another £165m will be paid out of a profit share scheme to 80,000 front line staff. But the chancellor added that "if they [employees] do not come up to the mark, that money can be clawed back". Mr Darling said that bonuses at Lloyds Banking Group would be subject to the same principles of not rewarding failure and focusing on the long-term strength of the bank. Meanwhile, the bank also unveiled a pay freeze this year for senior and US staff, and for those in its investment banking arm, while other staff will on average receive below inflation pay rises. The bank also said it was now conducting a review of its pay and incentive policies, with more details to follow in its forthcoming annual report and accounts. "A fundamental reform to pay and reward is needed to reflect the reality of the situation the company is in," said RBS group chairman Sir Philip Hampton. He added: "We fully recognise, as a company, that we have to change materially not just the business we do but also the way we do business. "Our overarching aim is to restore the standalone health of the group as soon as is practicable." Derek Simpson, joint leader of Unite trade union, said many of his members were "not in the City of London earning mega bonuses" and that their "small annual bonus" supplemented low incomes of as little as £12,000 a year. The union said it welcomed "the acknowledgement from the government that staff at RBS, and across the financial services sector, are not the culprits of the financial crisis and must not face cuts in their pay packets in a desperate attempt to satisfy the hunger of the pack". "To punish workers for the actions of senior bankers represents a demand for a pound of flesh from the wrong people. "Staff are among the victims, not the culprits of the financial crisis." Meanwhile, Conservative shadow chancellor, George Osborne, said: "The government has finally been dragged into acting on bonuses but once again it is too little too late." He added: "David Cameron said at the weekend that all cash bonuses over £2,000 should be stopped in the banks that have been bailed out." And Liberal Democrat economics spokesman, Vince Cable, said: "After weeks of political and public pressure, it is welcome if long-overdue news that RBS has at last come out with what seems to be an acceptable pay agreement." He added: "It is simply unacceptable that banks who have had to rely on taxpayer guarantees and handouts should pay bonuses to staff that are directly linked to their failures." Short-term cash bonuses have been heavily criticised for encouraging bankers to focus on short term profits. "These short-term cash bonuses have been so terribly destructive," said Ruth Lea at Arbuthnot Banking Group. "If the taxpayer hadn't bailed out this bank in the early part of October, this bank would have been bust and these people would have been out of a job," she added. 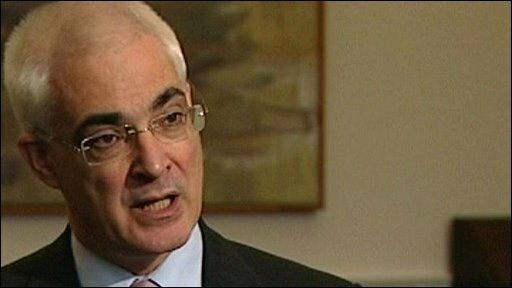 Last weekend, Mr Darling defended the government's handling of the banking crisis in light of expected record losses at HBOS. Lloyds Banking Group - which completed its takeover of HBOS last month - said its subsidiary would report losses of nearly £11bn for 2008.